For decades, Curecrete has focused solely on developing quality products that enhance concrete floors. The concrete densification and concrete polishing markets were created and pioneered by the development of the Ashford Formula™ in 1949 and the RetroPlate® Concrete Polishing System in 1999. Since the debut of these flagship products, Curecrete has continually led both industries as the expert leader – systematically developing only those products which focus on concrete floor performance and that outperform the competition. In 2019, Curecrete celebrates the 70th anniversary of its signature product, the Ashford Formula — a product that is known in the industrial and commercial sectors as the leader in permanently densified, dustproof and hardened concrete flooring. “We have floors that are 70 years old that are still in use today, and haven’t been retreated,” says Jerald Jones, president of Curecrete in Springville, Utah. The Ashford Formula, the secret sauce behind Curecrete’s success, was first developed shortly after World War II by a German chemist living in southern California. This one formula, and the business that utilized it, created an entire industry – the concrete densification industry. While concrete has been used for centuries as the building block of sturdy structures, it was often inadequate for certain types of applications because of its porous nature. This was especially true for horizontal floor surfaces susceptible to erosion and wear. Prior to the Ashford Formula, concrete contractors would treat concrete floors with surface membranes to protect it. But those surface treatments’ durability only lasted for so long before needing reapplication. The surface coating also did not harden the concrete surface. Enter the Ashford Formula. Ashford Formula is a densification product for concrete that provides permanent solutions to concrete floor surface problems. Instead of simply coating the concrete surface, Ashford Formula penetrates into the concrete surface, combines with the salts in the concrete and creates a permanently dense and hardened concrete surface. Thus, Ashford Formula becomes an integral part of the concrete. As the concrete is repeatedly used, cleaned and maintained, the densification process continues to harden and marbleize the concrete. 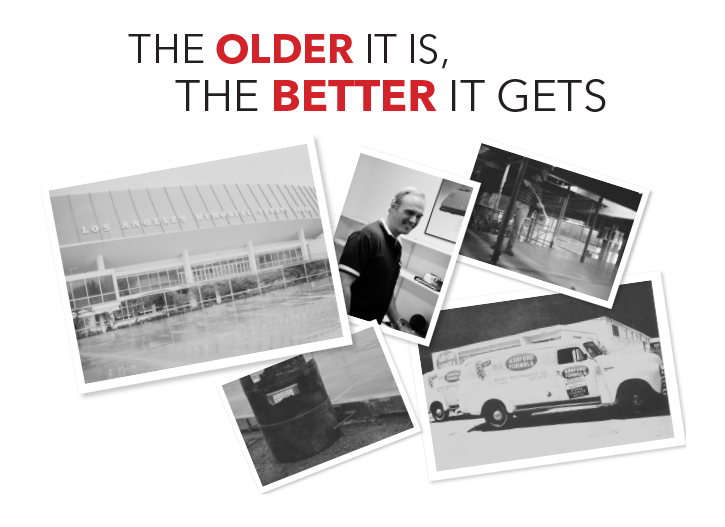 “The older it is, the better it gets,” Jerry attests. And Jerry knows what he’s talking about, as he’s worked with the Ashford Formula for more than 40 years. The Alkali Neutralizer Company in Los Angeles purchased the formula in 1947, and used it on industrial floors and parking decks. Casa de Cadillac dealership in Sherman Oaks, California, was the first company of note to sign on to use the formula on its showroom floors. Not only did the formula and densification process densify and strengthen the concrete floors, but it also made it less susceptible to immediate staining. As the first documented Ashford Formula project in 1949, the Casa de Cadillac dealership began the formula’s legacy of unmatched quality, performance and value. But first, Ashford Formula representatives had to teach contractors and architects about this new densification technology. In those early years, Curecrete Chemical Company purchased the Ashford Formula and its production rights, and made inroads early on with architects in the Los Angeles area. At the time, it was a process of educating architectural teams, and those who specified which materials were to be used on projects, on this new technology that would add significant value and life to their developments. Even 20 years later, when Jerry joined the company as a representative and applicator in 1970, his focus was on educating an unfamiliar audience of architects, engineers and owners on the concept and merits of concrete densification, as well as applying Ashford Formula on many significant projects throughout the Rocky Mountain area. He remembers spending a year convincing the original architect team leader for the Brigham Young University Marriott Center in Provo, Utah to use the product. This was par for the course then – on every one of those many early projects in the 1970s, Jerry spent most of his time educating decision-makers about the long-lasting value and benefits to using the Ashford Formula. Upon the retirement of its owners, Jerry purchased Curecrete Chemical Company in 1978. He relocated the company’s corporate headquarters and production to Utah, where he resided, and started reaching out to more contractors, architects and other decision makers about the benefits of concrete densification. To expand the company further than the Los Angeles and Rocky Mountain areas, he learned early on to connect with materials representatives all over the country who were known and trusted by local architects there. Densification technology was still new to many at the time, and it took a lot of faith on the part of architects and contractors to believe that the formula would be as effective as Jerry said it would. He credits the growth of the company to those local reps.
Curecrete grew, and started to land significant projects: the LA Sports Arena, the General Dynamics hangar, the Smuckers warehouse, the Coors Light distribution center and others. In 1984, Curecrete introduced concrete densification to big box retailers, including Lowe’s, Costco, Walmart and Target. Again, Jerry says it took a year of education and discussions to convince the first one to sign on, but once they did, it became a solid flooring partnership for the next decade. As those companies started to expand across the nation, the Ashford Formula became the foundation they placed their shelves and products on. Once this happened, though, large chemical companies started to take notice. Before big box retailers started using the Ashford Formula, Curecrete and its densification technology flew under the radar – hardening and marbleizing floors all over the country, but quietly doing so. Curecrete built the densification industry and once it became popular within the retail sector, others wanted to be a part of it. “By the time they took notice, there was enough we’d done that they knew it was legit. They knew they needed to do it to stay relevant in the market,” Jerry says of that time. Before big box retailers, Jerry says his challenge was educating users on this new technology and industry. After going into big box stores, the challenge was the competition. Today, Jerry estimates there are dozens of other concrete densification manufacturers out there. But only one company – Curecrete – has been there since the beginning, with floors that have outlived their applicators. And Curecrete continues to innovate as an industry leader. In 2019, the company will also celebrate the 20th anniversary of the RetroPlate Concrete Polishing System, a product that began as a way of removing old, worn out coatings and providing owners and facility managers with long-term solutions. In 1999, Jerry and his team realized they could combine the densification technology of the Ashford Formula with the diamond polishing process normally used on stone. After countless hours of research and development, laboratory and field testing, the RetroPlate Concrete Polishing System was the first concrete polishing system in the market, and birthed the concrete densification-polishing industry. By chemically treating the floor and polishing the bare concrete, the RetroPlate System creates a highly abrasion-resistant, dust-proofed, polished floor that is easy to maintain. With different coloring products, it elevates normal concrete flooring to a beautiful aesthetic that creates its own ambiance. Today, you can see the high sheen of RetroPlate polished concrete on the floors in high-end car dealerships, office buildings, restaurants, hotel lobbies, museums, schools and universities, and so on. The Ashford Formula has now densified more than five billion square feet of concrete. That’s enough concrete to create a two-and-a-half-foot sidewalk that circles the equator fifteen times. Additionally, the RetroPlate System has polished more than 237 million square feet of concrete. Not only could both systems circle the globe multiple times, both are used on floors across the globe. In 1981, the first international distributor of the Ashford Formula was established in Australia. Today, the Ashford Formula and the RetroPlate System are represented in more than 100 countries around the world. Curecrete products can be found on floors in China, Turkey, South Africa, Australia, Brunei and more. As the most widely specified and used liquid concrete densifier and hardener in the world, and developer of the concrete densification and polishing process, Curecrete single-handedly pioneered, built and leads the densification industry.